Metro’s Crenshaw Line Extension should connect with hospitals and tourist centers—not strip malls. 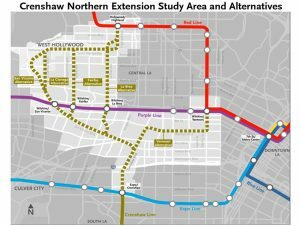 This fall, the public will be briefed on the five options for Metro’s planned extension of the Crenshaw Line, which could connect the Crenshaw District to Hollywood as soon as 2028. West Hollywood—which voted overwhelmingly to tax itself to fund transportation—is jubilant that it will finally get a train line. The bad news is that only two of the five options would really benefit population-dense, amenity-laden WeHo. One seemingly out-of-nowhere option Metro is considering is having the light rail line veer east in Mid-City, connecting to the Purple and Red lines in Koreatown. This option wouldn’t come anywhere near WeHo or Beverly Grove. WeHo has been lobbying hard for a line for years and is willing to contribute tens of millions to fund it, so this option doesn’t stand much of a chance. The other four options will move north via either San Vicente, La Cienega, Fairfax, or La Brea. 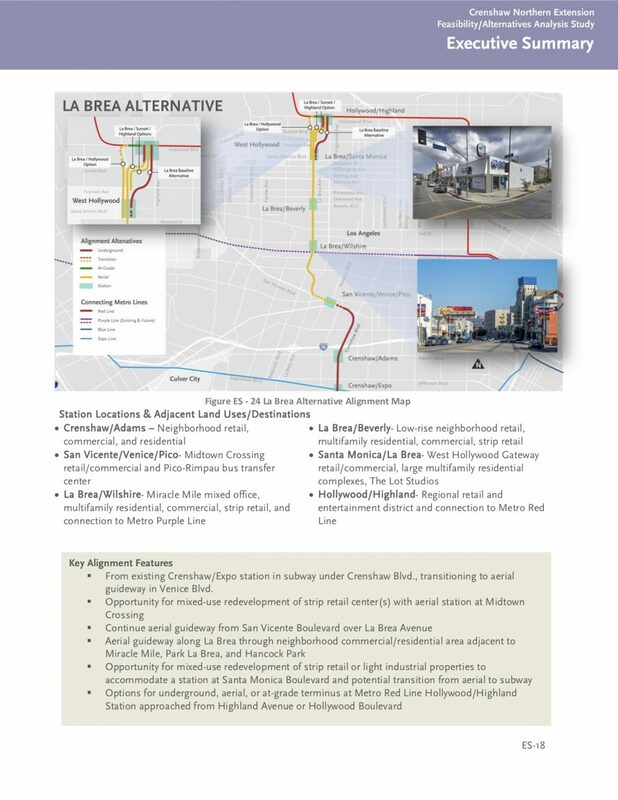 Many are advocating for La Brea, which would provide a relatively straight shot up to Hollywood and cost the least—about $1.4 billion less than the San Vicente or La Cienega options (each around $4.4 billion) and $1.7 billion less than the underground Fairfax route ($4.7 billion). This is all true, but a La Brea route—which would mostly carry trains on an elevated track akin to the Expo Line’s route through Mid-City—would also barely skirt WeHo, and altogether miss its most notable destinations. Think about it: the San Vicente route could drop people off at the Beverly Center, Cedars-Sinai Medical Center, and the Pacific Design Center; the La Cienega route would hit Restaurant Row and the Bev Center; and Fairfax would reach the Grove, the Farmers Market, Park La Brea, CBS, and possibly Little Ethiopia. A La Brea light rail line would connect a Target and a Trader Joe’s. 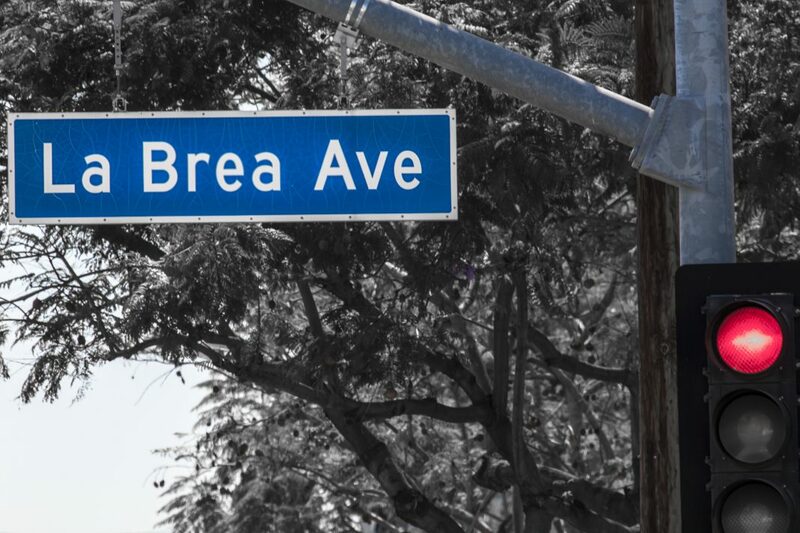 While, La Brea Avenue has densified in the past decade, it’s still not a destination in and of itself. Connecting to the aforementioned destinations would require a bus, bike, Bird, or Uber from La Brea. While the Expo Line skirts downtown Culver City, the Red Line just misses the Hollywood Bowl, and the Green Line doesn’t get people directly to LAX, a La Brea line feels like missed-opportunity déjà vu. This may be an instance where a straight line is not the most logical route between two points. RELATED: Where Should WeHo’s Rail Line Go?